The pressure cooker is such a great kitchen appliance for those with little time to cook. The raised pressure and temperature not only cooks food more rapidly—it also seals in moisture and prevents the loss of precious nutrients in meat and vegetables that can happen with overcooking, making this a healthy way to prepare your favorite meals. If you've never used one of these appliances before, you'll be amazed at the wide variety of pressure cooker recipes. We've rounded up our favorites here, from hearty pot roasts and stews to comforting chicken and rice dishes and so much more. 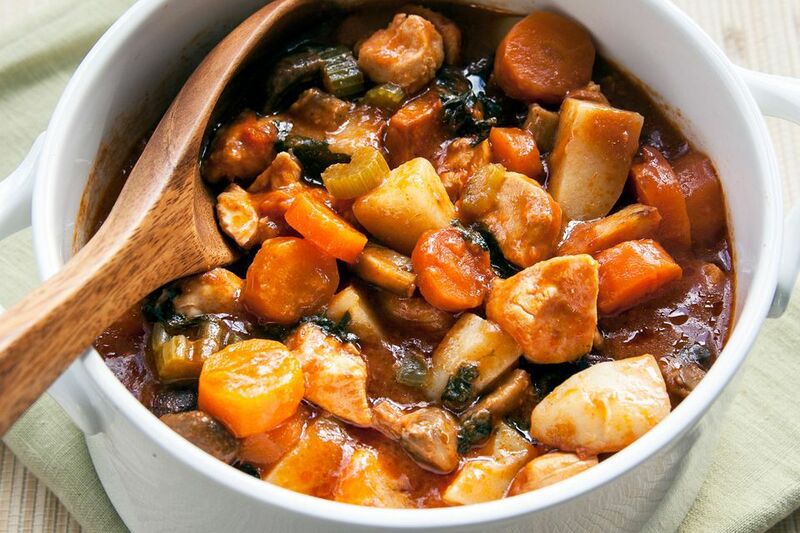 A great chicken stew is a recipe that every home cook should have in their back pocket. This comforting pot is prepared in a pressure cooker or slow cooker for a quick and simple meal that really delivers on flavor. With potatoes, corn, onion soup mix, and tomato sauce, it uses simple ingredients to create a warming dish. If you love Tex-Mex tacos, you're going to flip over this beer braised chicken. Use a pressure cooker to make the filling, which uses flavors chicken thighs with salsa, beer, and finely chopped chipotle peppers. Serve in tortillas with your favorite taco toppings. This rich pressure cooker chicken dish cooks in minutes so you can enjoy it sooner rather than later. There's something so wonderfully comforting about the flavor combination of juicy chicken and earthy, tender mushrooms. This is one of those go-to recipes that you can serve to your family on weeknights or proudly offer to company. Chicken cacciatore is a classic Italian-American dish that makes a great family dinner. This pressure cooker version has an amazingly rich flavor and it's done in just 10 minutes, making it great for busy weeknights. Homestyle pot roast in under an hour? Yes, it's possible! This beef is seasoned simply with salt and smoked paprika, but you can add other spices and herbs to if you want to customize it. The roast makes a terrific holiday main or a great special-occasion dinner when you want to impress guests. This brisket dinner is about as easy as cooking dinner gets. Just combine all the ingredients in the pressure cooker and set it for an hour. Return in 60 minutes to find fork-tender and juicy meat simmering aside potatoes, carrots, and pearl onions. When you're craving a meal that will really stick to your ribs, try this oxtail ragout ladled over hot pasta. Onions, garlic, turnips, carrots, herbs, spices, and stout come together to add tremendous flavor to chunky meat. Called pulao, this North Indian rice pilaf is cooked in meat stock to create a rich intensity of flavor. Toss the ingredients in your pressure cooker and return to a side dish that pairs wonderfully with curries and stews. Add a dollop of plain yogurt on top to add soothing creaminess. There's true depth of flavor in this fabulously easy beef stew, even though it's ready in just 20 minutes (no one will be able to tell, we promise!). Like a slow cooker, the pressure cooker holds in all the flavors as the food cooks, creating a hearty meal that's absolutely mouthwatering. Beef brisket is a main that's welcome at Passover dinner, Easter celebrations, and other occasions when families gather. A pressure cooker infuses the flavors of the Southwest into tender slips of beef in just under an hour. Serve with mashed potatoes or polenta to soak up all of the irresistible sauce. Here's a delicious pork roast that you can serve at Christmas and other holiday parties or whenever you want to treat friends and family to a special meal. Unlike traditional roasts, this one only takes an hour to make, but your secret's safe with us! Beef soup is a Caribbean tradition and this pressure cooker version brings a taste of the island into your own home. Ready in just over an hour, you'll find the flavor combination of tender meat, vegetables, spices, and dumplings hard to resist. A pressure cooker is the perfect tool for cooking the veggies in this cream of asparagus soup. Combined with butter, cream, and vegetable stock, the mild flavor of asparagus shines through in each velvety-smooth bowl. Have you always put off cooking artichokes because they take so long to steam? Learn how to make the vegetables in a pressure cooker and you'll be able to get a plate on the table in a fraction of the time. 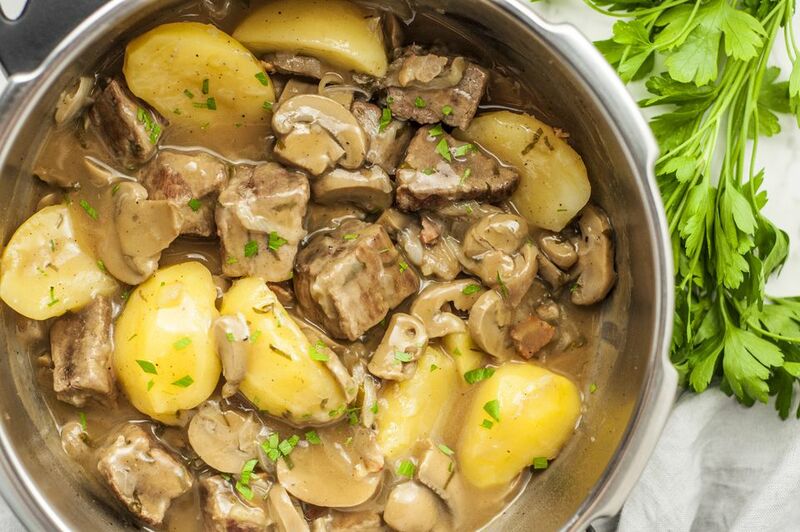 This easy beef stew is a fabulous one-pot meal that's ready in just about 20 minutes. Sweet green and red peppers, potatoes, carrots, and other vegetables are simmered with beef chunks, tomatoes and aromatics to create a comforting dinner. A pressure cooker is a great way to cook a round steak, which has less fat than many other cuts of beef. Using the quick-cook appliance retains much more moisture inside this particular cut for melt-in-your-mouth results. Want a reliable spaghetti sauce that you can get together quickly on busy evenings? This satisfying pressure cooker recipe is incredibly easy to make and truly tastes like it's been simmering for hours. Have a creamy risotto ready in just half an hour with no stirring at the stove top—this genius recipe lets you do just that. Cooking risotto in your pressure cooker is easy and creates the perfect texture. This pressure cooker pulled pork tastes like it's been cooked low and slow all day, even though it's ready in a little over an hour. Whether you enjoy it in a sandwich, in tacos, as a pizza topping, or on top of macaroni and cheese, the saucy shredded pork is sure to become a family favorite. It's hard to believe you can have a complete meal with tender, melt-in-your-mouth beef in less than an hour and a half. Thankfully, your pressure cooker handles that task with ease. Meaty saucy short ribs make a great meal served over rice or with boiled or mashed potatoes on the side. Cajun-spiced pressure cooker jambalaya is a one-pot meal you'll want to make again and again. After you've browned a few ingredients, the whole recipe finishes in just minutes. This rich and filling split pea soup incorporates orzo pasta for a fabulous and warming meal on cooler days. Serve with crackers or bread sticks for crumbling and dipping. Sweet shredded cabbage adds something special to this flavorful Moroccan tagine. Combine the vegetable with lamb, fragrant spices, preserved lemons and olives to form a tangy, meaty stew that's great for warming your stomach on cooler days. Easy to make, but hard to resist—that's this caramel custard. Steaming it in the pressure cooker makes this velvety dessert a breeze to prepare, which is dangerous considering how quickly you'll finish one.